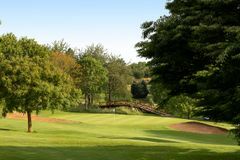 Golf breaks in Normandy, France, French Golf holidays & Golf weekends in France. Stretching along the coastline from Pas-de-Calais, and South towards Paris and the Loire, Normandy’s varied landscape and rich history make it fascinating to visit. Normandy is rated 4.8 out of 5 based on 6 verified reviews from YGT customers. They played and stayed (we even checked they signed their scorecards). For the travelling golfer, the region has much to offer; dotted along the coastline are idyllic cliff-top courses at Omaha Beach and Etretat, in addition to the golf resort town of Deauville, while further inland Normandy also boasts luscious parkland layouts like the Golf Parc de Nantilly. The region attracts flocks of tourists thanks to its historic coastline, the site of the wartime Normandy landings; be sure to also take in the military cemeteries and the countless D-Day monuments. The resort towns of Trouville and Deauville offer superb nightlife and a buzzing atmosphere, especially during the summer months, while notable tourist attractions include the Mont Saint-Michel and the incredible tapestry at Bayeux. If you fancy a flutter, Deaville and Trouville are home to France’s most renowned casinos, and with this fine array of courses, resorts and attractions, a golf holiday in Normandy is no gamble.